Chase is launching Chase Secure Banking, a low cost checking account that can help more consumers around the country access a traditional banking relationship, including those new to banking or who have had trouble getting or keeping an account in the past. Chase Sapphire, a premier travel credit card and sbe, a leading global lifestyle hospitality company, today announced a new relationship providing Chase Sapphire Reserve ® cardmembers access to a range of benefits at select global sbe properties including complimentary food and drink credits, upgrades, and for every four consecutive nights booked at sbe owned and managed properties, cardmembers will receive the fourth night free. Additionally, Sapphire Reserve and Preferred cardmembers will have unique access to lounges at some of sbe’s most popular experiences that will be announced throughout the year. Chase Home Lending today introduced its new Closing Guarantee for existing Chase customers. Chase commits to closing customers on their new homes within 21 days or gives them $1,000 cash. 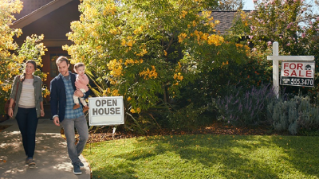 This new offer gives Chase customers a competitive advantage when submitting an offer to buy a home, and financial peace of mind to sellers and real estate agents. Today, Chase released the latest Housing Confidence Index TM, in partnership with Pulsenomics, with underlying data from The U.S. Housing Confidence Survey TM showing more than one-half of Baby Boomers plan to age in place, opting for home renovations to accommodate growing needs. 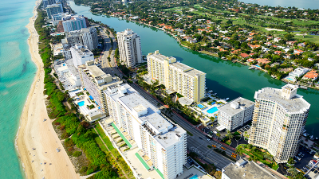 While the Millennials are making headlines as the largest home buying group today, Boomers are still flexing their economic muscles as an influential generation in the housing market, with 10,000 people reaching retirement age each day. Chase today encouraged customers affected by the U.S. government shutdown to call if they need help with their Chase mortgages, credit card accounts or car loans. Chase highlighted today that its payment relief options for affected U.S. government employees extend to all its auto customers, including those with loans and leases made through Subaru Motors Finance, Mazda Capital Services, Jaguar Financial Group, Land Rover Financial Group and Enterprise Auto Finance. Chase today announced new and enhanced features that will give customers greater control of their money, from saving to investing to keeping their credit in check. Chase today announced efforts to help its customers who are U.S. government employees affected by the U.S. government shutdown. 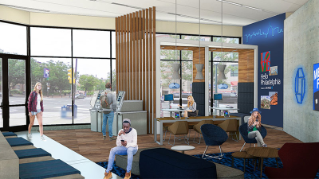 JPMorgan Chase today announced the opening of its first retail branch in Greater Boston along with new lending commitments and investments in local workforce development to prepare area Boston residents for in-demand jobs. Today, Chase Freedom announced three rewards categories to start 2019 off fast: gas stations, drugstores and tolls. Cardmembers can earn 5% cash back on up to $1,500 in combined purchases in the categories from January 1 through March 31. Just in time for the holiday season, Chase customers have a new, easy way to find deals and earn statement credits when shopping at their favorite retailers with the introduction of Chase Offers. As the No. 1 credit card issuer in the U.S., Chase is teaming up with Visa to bring tap to pay to the industry’s largest portfolio of credit cards. In the coming months, millions of Chase customers will benefit from a fast, easy, and secure checkout experience, saving valuable time by completing a transaction with a single tap. JPMorgan Chase today announced the grand opening of its first branch in Greater Washington, D.C. and made several new investments to increase economic and wage growth in the region. 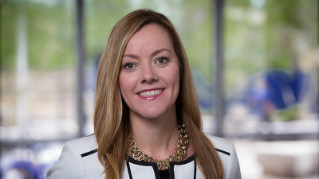 Chase Auto Chief Marketing Officer Melinda Welsh has taken on the additional role of leading the direct lending business. 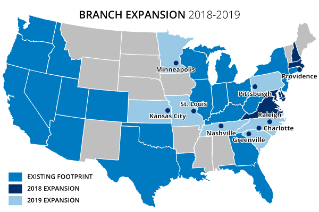 The combination of marketing and direct lending is a new one for Chase Auto and Welsh will be the first to take on the leadership of both consumer-facing teams. Chase Home Lending, in conjunction with Pinterest, today debuted its “Pins & Properties: Chasing Your Dream Home” report at the Pinterest New York City office, along with TV personalities, entrepreneurs and authors, Drew and Jonathan Scott. The Scott Brothers shared tips and trends for making a dream home renovation a reality. The collaboration between these powerhouse brands examined what homeowners are searching for to upgrade their starter homes. Chase Card Services (NYSE:JPM) is pleased to launch the new Apple Ultimate Rewards Store. 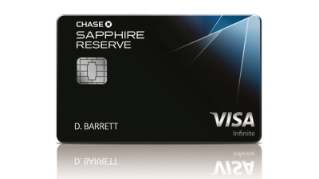 The newest enhancement to Chase’s rewards platform gives Chase Sapphire®, Freedom® and Ink® cardmembers the ability to redeem points to cover all or a portion of Apple products purchased through Ultimate Rewards. As a special limited time offer, cardmembers can redeem one Ultimate Rewards point for one cent, meaning 100 points can be redeemed for one dollar on eligible Apple merchandise. JPMorgan Chase (NYSE: JPM) today announced an agreement with Plaid, a leading data aggregator, marking an important milestone in efforts to protect customers’ financial data. This will help customers use popular financial apps to make smart decisions with their money while giving them control over how their data is accessed and used. 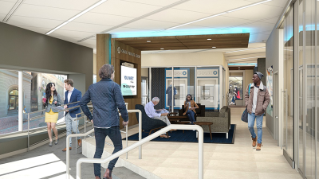 JPMorgan Chase & Co. (NYSE: JPM) announced today its plans to build a new fintech campus in Palo Alto. The new campus located at 3223 Hanover is scheduled to open its doors in 2020 and will house over 1,000 employees. Expected to break ground in early 2019, 3223 Hanover will feature a modern workplace design with amenities that matter most to employees and state-of-the-art technology to increase collaboration. With a new lock/unlock feature launching today, Chase is giving customers peace of mind with the power to temporarily turn off their Chase credit cards immediately, stopping them from being used when left behind or misplaced. JPMorgan Chase today announced an expansion of its branch network to Philadelphia and the Delaware Valley and several new commitments that support economic growth and workforce development in the region. This expansion is part of the firm’s recent $20 billion, five-year investment in its business and local economic growth. Chase Home Lending, in partnership with Pinterest and featuring TV personalities, Drew and Jonathan Scott, today announced “Chase Dream Boards.” This interactive web experience is designed to deliver inspiration and guidance to consumers who are considering a home renovation. Upon completing a quick online questionnaire about their home improvement project, consumers are presented with a personalized Pinterest Board complete with inspiration, tips and advice from Chase and the Scott Brothers. Today, Chase Freedom announced new quarterly categories for the upcoming holiday season – wholesale clubs and department stores– and also brought back one of its most popular categories, Chase Pay. Just in time for the holidays, cardmembers can easily get rewarded on their purchases during the busiest time of the year with 5% cash back on up to $1,500 in combined purchases in these categories from October 1st through December 31st. Chase Card Services, a division of JPMorgan Chase & Co., and JetBlue today announced the addition of the airline’s TrueBlue loyalty program as the newest Chase Ultimate Rewards point transfer partner. As we approach the one-year anniversary of Hurricanes Harvey and Irma’s devastation on the Gulf coast, Chase Home Lending is providing homeowners with proactive tips to prepare for a season of potential hurricanes, tornadoes and wildfires. (NYSE:JPM) and Expedia Group announce a strategic alliance that will enhance the Chase Ultimate Rewards travel hub with more choices, new capabilities and even more redemption flexibility. 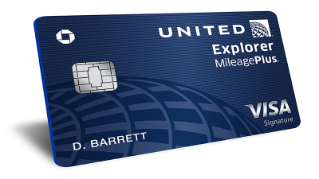 Chase cardmembers will have access to an enhanced Ultimate Rewards travel booking experience featuring Expedia Group’s industry leading network of flights, hotels, vacation rentals, car rentals, as well as more than 25,000 experiences and activities. The enhanced experience is currently available to Chase Freedom® and Freedom Unlimited cardmembers, and will be introduced to Chase Sapphire® and Ink cardmembers over the next few months. Chase today announced that customers can now get cash through their phone’s mobile wallet at nearly all of its 16,000 ATMs nationwide, as well as access to all ATM vestibules outside of the branch. Starting today, Chase Pay customers with compatible flagship Samsung Galaxy smartphones now have the option to link Chase Pay to Samsung Pay. Today, (NYSE:JPM) and (NYSE: LUV) introduced the new . 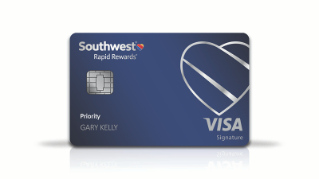 The Priority card has all of the same benefits as the award-winning Southwest Rapid Rewards Premier Credit Card plus more anniversary points and new features that provide inflight savings and an elevated travel experience. 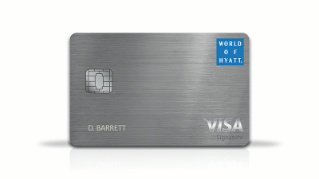 Chase Card Services (NYSE:JPM) and Hyatt Hotels Corporation (NYSE: H) today announced the launch of the new World of Hyatt Credit Card, designed to reward today’s travelers for making everyday purchases – both while at home and on the road. From fitness to transportation to dining, World of Hyatt cardmembers will be rewarded for their spend, making it easier to elevate their status and earn free nights at Hyatt destinations. Cardmembers will also be able to earn Bonus Points with the addition of a new fitness club and gym memberships category. Chase today announced that its all-mobile bank, Finn by ChaseSM is now available nationwide to iOS users, offering millions of consumers a fully digital banking experience that helps them spend smarter and save better. This is the next big step of Finn’s customer roll-out following its debut in St. Louis in October. Today, Chase introduces a new housing confidence index in partnership with Pulsenomics showing record highs among U.S. homeowners and renters in three key measurement areas: their take on market conditions, aspirations for homeownership, and expectations regarding home values and affordability. Tock® and Chase Pay® are reinventing the culinary experience for millions of Chase cardholders by integrating into Tock’s restaurant booking system and offering customers exclusive access to everything from chef’s tables to winery tours, pop-ups, curated menus, and events. 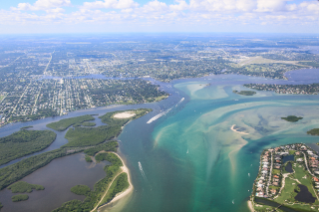 JPMorgan Chase announced today that it is expanding its J.P. Morgan Securities business into Miami and has significantly grown its Private Bank in South Florida by adding 15 new advisors. 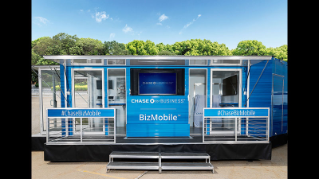 In this age of food trucks and pop-up shops, Chase is rolling out the BizMobile, a business advice center on wheels. Small business owners can pop in for free consultations on topics that go beyond checking accounts and credit cards. 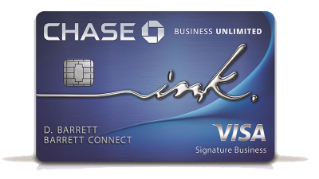 Chase is introducing Ink Business Unlimited today, a new credit card for small business owners with a simple proposition: unlimited 1.5 percent cash back on purchases so business owners have one less thing to think about when running their business. Tens of thousands of small and mid-sized retailers who sell on ecommerce platform BigCommerce will soon be able to accept Chase Pay on their online stores, making it faster for 61 million Chase Visa credit and debit cardholders to complete checkout in seconds using their Chase credentials. Today, travel is about more than just the destination itself, it’s about connecting to the places, people and experiences that can enrich our lives. Chase Card Services and Marriott International have launched the new Marriott Rewards Premier Plus Credit Card, designed to give cardmembers the opportunity to experience more – whether that means a journey of self-discovery or finding time to reconnect with loved ones. 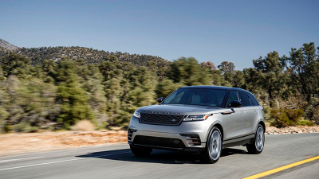 Chase Auto and Jaguar Land Rover North America announced today the renewal of their private label agreement, extending Chase’s role as the private label finance provider for the auto manufacturer. During this year’s National Small Business Week, JPMorgan Chase is celebrating by holding events for and in support of small business owners. JPMorgan Chase & Co. today announced that it will begin using individuals’ unique voiceprints to identify customers who are calling to inquire about their credit card accounts. Called Voice ID, this proven technology will improve customer security and allow cardmembers to more quickly and easily receive service. , the leading co-brand credit card issuer in the U.S.,and ® (InterContinental Hotels Group), today announced the newest additions to their credit card portfolio, the IHG® Rewards Club Premier Card and the IHG® Rewards Club Traveler Card. The Premier Card sets a new standard for credit card benefits at IHG, including 10X points on purchases at IHG hotels, 2X points on purchases at gas stations, grocery stores and restaurants, and 1X on purchases everywhere else. Customers who visit more than 10,000 participating Shell branded retail stations in the U.S. can now check out using mobile payments with Chase Pay, saving them time and money. , the leading co-brand credit card issuer in the U.S., in partnership with Avios Group (AGL) Limited, today announced the launch of the Iberia Visa Signature Card with an Aer Lingus Visa Signature Card following later this spring. Both cards offer 3 Avios per $1 spent on Iberia, Aer Lingus, British Airways, LEVEL and OpenSkies, and 1 Avios per $1 on all other purchases. 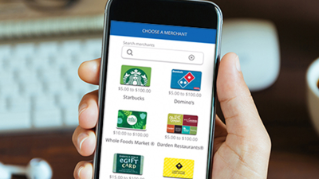 Today Chase Freedom adds a new quarterly category – PayPal – and brings back customer favorites – Chase Pay and grocery stores –from April through June. This new category is the latest way that Chase and PayPal continue to utilize the two companies’ partnership to deliver new benefits to consumers. 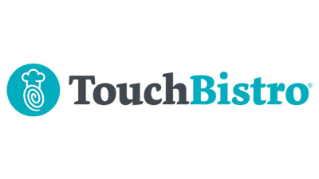 TouchBistro, the provider of iPad POS software that has helped more than 12,000 restaurants improve their business operations, is introducing TouchBistro Payments powered by WePay, a Chase company. 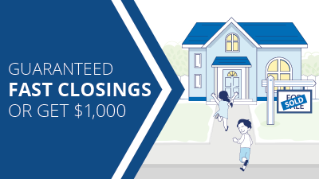 Starting today, Chase Home Lending is offering up to $3,000 in grants and incentives to cover closing costs and down payment for families buying a new home in a low- to moderate-income (LMI) community. Qualified homebuyers in LMI areas across the country can now receive a $2,500 grant and an additional $500 for customers getting a DreaMaker mortgage after they complete a homebuyer’s education course. 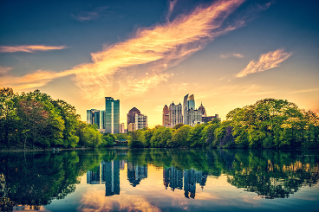 According to the American Community Survey census data, more than 90 million people currently live in eligible lower income areas across the country. Meijer customers across the Midwest are in for a faster and more rewarding checkout experience when Chase Pay, the digital engagement wallet from JPMorgan Chase, rolls out in stores later this year. Chase Pay will allow millions of Chase card customers to check out with their mobile phone when visiting their favorite local store. American business owners are feeling better than they have in years, thanks in part to recent regulatory reform, corporate tax cuts and a steadily improving economy. But they’re getting nervous about finding the skilled workers they need to grow as their older workers retire, according to the annual JPMorgan Chase Business Leaders Outlook report released today. Chase today announced efforts to help its customers who are U.S. government employees – including members of the military and the reserve - affected by the U.S. government shutdown. Today, Starbucks (NASDAQ: SBUX) and Chase (NYSE: JPM) announce the availability of the Starbucks Rewards™ Visa® Card, a co-brand credit card integrated directly into the Starbucks Rewards™ loyalty program. 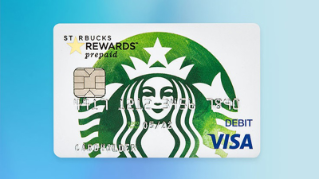 Customers using the card earn Stars with every purchase both in and out of Starbucks stores wherever Visa is accepted worldwide, and can be redeemed for food and beverage items at more than 8,000 participating* Starbucks locations. 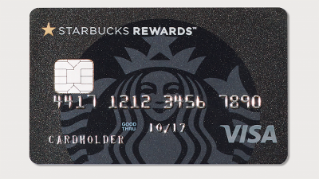 Cardmembers will also become members of the Starbucks Rewards loyalty program, receiving exclusive perks and benefits already enjoyed by more than 14 million members daily. JPMorgan Chase today announced a $20 billion, five-year comprehensive investment to help its employees, and support job and local economic growth in the United States. The firm has always believed that the highest and best use of its capital is to support employees and local communities and businesses by doing what a bank is supposed to do: lending and investing. The is teaming up with —the digital engagement wallet from JPMorgan Chase & Co.— to offer mobile payments starting with select retail markets and e-commerce programs in 2018. This holiday season consumers shopping for a new car or truck may be looking online now more than ever. Nearly half of Americans (47%) said they would be comfortable completing their purchase online—from research to financing—according to new research from Chase Auto Finance. Chase Pay is introducing the Chase Pay Village at The Oculus at Westfield World Trade Center – a curated shopping experience and holiday market featuring unexpected moments of joy, open to consumers for 6 weeks, from now through January 7, 2018. WePay announced today it is officially a Chase company, after JPMorgan Chase completed the transaction announced in October. WePay will continue to provide integrated payments to global software platforms like Freshbooks and Constant Contact, now with the backing of the nation’s largest financial institution. As part of the Chase family, it will provide instant merchant onboarding and give software developers and partners access to Chase’s network of four million small business clients. Small gestures can bring much-needed cheer for Americans feeling slighted by combined birthday/holiday celebrations. 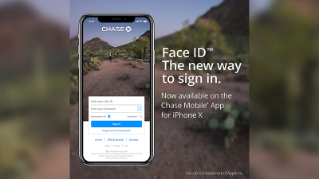 Face ID uses facial recognition software as another quick, convenient and secure way for customers to access the Chase Mobile App and manage their accounts. Eligible Chase cardmembers can now redeem Ultimate Rewards for Avios and Travel to Ireland, Spain and more European destinations on Aer Lingus and Iberia Airlines. JPMorgan Chase & Co. announced $4.2 million in investments to support veteran-owned small businesses. 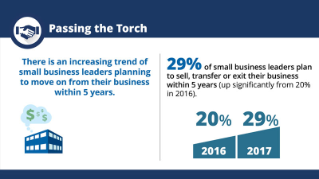 More small business leaders are planning to sell, transfer or exit their business within five years, as discovered in the latest Business Leaders Outlook report from Chase for Business. The survey found 29% of small businesses plan to transition, up from 20% last year. Chase ranked highest in customer satisfaction among small business owners in the West region, according to the 2017 J.D. Power study on U.S. small business banking. It’s the fifth year in a row that Chase has received the top ranking in the West. Chase today unveiled Finn by ChaseSM, a new all-mobile bank that gives consumers greater control of their everyday spending and saving—and happiness—through a fully mobile experience. JPMorgan Chase & Co. (NYSE: JPM) announced today its plan to acquire WePay to make it easy for business app makers and independent software vendors (ISVs) to seamlessly integrate payments into the software commonly used by small businesses. Americans are tracking their credit health just in time for Credit Awareness Month, according to the Chase Slate 2017 Credit Outlook. They are taking steps toward managing their credit scores on a regular basis. For the first time in 23 years, JPMorgan Chase & Co. led the nation in total deposits as consumers and businesses added $96 billion to their bank accounts in the last year. JPMorgan Chase & Co. today announced a $1.5 million investment over five years to support new affordable housing opportunities for the residents of the city’s South Side. JPMorgan Chase announced today its plans to deliver a simpler and faster way for businesses to send and receive invoices and payments. This new automated payments solution will be part of Chase’s enhanced digital platform, and it will help clients save time and improve cash flow. Americans have a thing or two to say about finances – especially for summer romances now in full swing, according to the Chase Slate 2017 Credit Outlook. JPMorgan Chase (NYSE: JPM) and OnDeck (NYSE: ONDK) today announced a contract extension to continue their collaboration on the bank’s digital small business lending product, Chase Business Quick Capital®, for up to four years. JPMorgan Chase (NYSE: JPM) and PayPal (NASDAQ: PYPL), two global payments leaders, have announced a partnership that will make it easy to add Chase cards via Chase Pay to PayPal accounts, and will soon offer customers the option of paying with Ultimate Rewards points when linked through Chase Pay at PayPal’s millions of online merchants. Chase Home Lending today announced, in partnership with Google, insights that show consumers are clicking their way to finding their first home and figuring out how much they can afford. While fewer U.S. Hispanics are satisfied with their credit score compared to Americans nationally (47% vs. 55%), more than half have a plan to improve their credit health, according to the Chase Slate 2017 Credit Outlook Survey. Millennials are taking their role as the next generation of homebuyers seriously, with one-third of them (33%) planning to purchase a home within the next four to five years, according to the Chase Slate 2017 Credit Outlook. That ambition has Millennials focusing on their credit scores and working to improve their credit health overall. 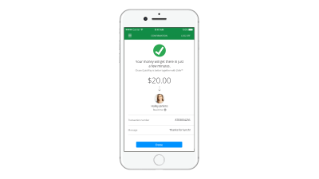 Customers can receive and send money to more people in real time. Chase is expanding its branch presence to northern Nevada and will open its first two locations in Reno in the fall. 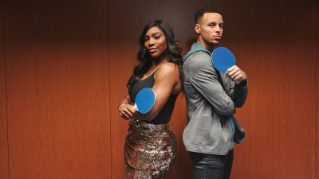 Chase today announced the launch of its new Battle of the Paddle digital banking campaign– bringing together two of the biggest names in sports for the first time. 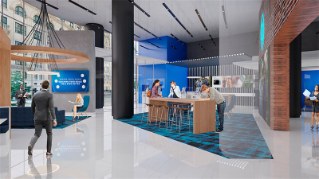 Chase is continuing to expand its presence in Florida, with plans to open its first locations in Gainesville and Ocala in early fall this year. Andrew Kresse has been named CEO of Business Banking, succeeding Jennifer Piepszak, who was named CEO of Chase Card Services last month. He will report to Gordon Smith, CEO of Chase Consumer & Community Banking. Leslie Gillin has joined Chase to manage partnerships with some of the world’s most prominent brands as President of Chase Co-Brand Credit Cards. She succeeds Richard Quigley, who retired in late 2016. 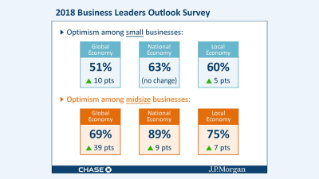 Executives from midsize and small businesses feel dramatically better about the U.S. economy than a year ago, according to the 2017 JPMorgan Chase & Co. Business Leaders Outlook report released today. At the launch of PHX Startup Week today, JPMorgan Chase announced $925,000 – almost $1 million - in charitable contributions to nonprofit organizations that provide programs to assist underserved entrepreneurs, including women and minority small businesses, throughout Arizona. Chase today announced its plans to launch a digital, self-serve mortgage platform that offers a simpler, faster, and more transparent home financing experience for consumers, from home loan application to closing. 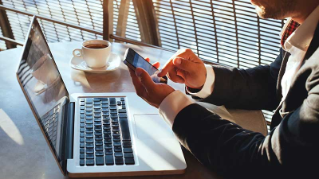 The new technology, expected to launch later this year, will allow customers to track a loan application through closing entirely online or from any mobile device. Jennifer A. Piepszak has been named CEO of Chase Card Services, succeeding Kevin Watters, who will retire later this year. She will continue to report to Gordon Smith, CEO of Chase Consumer & Community Banking. JPMorgan Chase (NYSE:JPM) and Intuit Inc. (Nasdaq: INTU) have signed an agreement to give customers greater control of their financial information to help them make better financial decisions, the companies announced today. 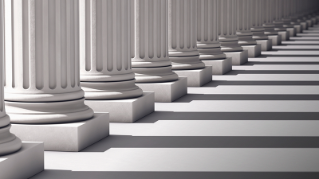 This agreement sets the bar for how banks and technology companies can work together to serve their shared customers. Chase Card Services, a division of JPMorgan Chase & Co. [NYSE: JPMC], today launched a new website that helps consumers across the United States see, understand and make decisions based on their credit score. Atom Tickets, the innovative mobile-first movie ticketing platform, will integrate Chase Pay® as its preferred method of payment early next year. Starting today, Chase customers can download and pay with Chase Pay®, the new digital payment solution that works in stores, in app, and online. The Chase Pay app works at the more than 7,500 participating Starbucks® locations in the U.S. and nearly 1,400 Best Buy® stores. 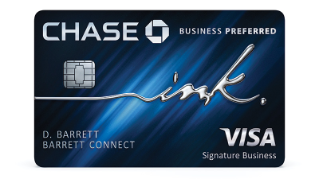 Businesses can earn more rewards on frequent expenditures with the new Chase Ink Business PreferredSM credit card. It rewards the spending of today’s businesses with three points per dollar on the first $150,000 spent each account anniversary year in combined purchases on travel, shipping purchases, advertising purchases with search engines and social media sites, and on internet, cable and phone services. Of course, Boomers had “THE Talk” about the “birds and the bees“ with their kids. But they put more value in having the “money talk” because they want to be much more open about finances than their parents were with them. 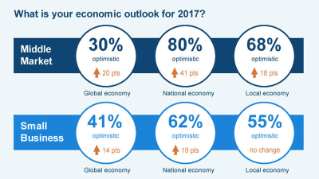 Newest Chase survey “Business Leaders Outlook“ reveals optimism for businesses and industry, but caution about overall economy. Hispanic owners use more technology, expect sales and profits to increase. 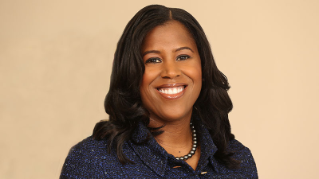 Chase announced today that Thasunda Duckett has been named CEO of Consumer Banking. She was previously CEO of the firm’s Auto Finance business. Hear what experts have to say on what you should be doing to protect your money. 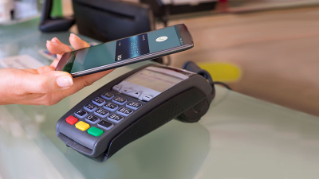 Beginning today, Chase Visa® consumer credit and debit cardholders can now use Android Pay™ to make simple and secure payments in stores and in mobile apps. Chase today announced the launch of Chase Auto Direct, a new digital offering that lets Chase customers shop for a car and secure financing through their computer or smartphone, and then close at a dealership served by Chase. This new service is now available to existing Chase customers in select U.S. states. 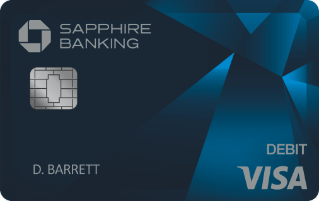 Chase expands the Sapphire card portfolio, offering a 100,000 points sign-on bonus and the richest rewards value on a wide range of travel purchases. Americans love mobile technology and digital banking more than ever, Chase survey shows. Chase customers can now send and receive money with customers of Bank of America and U.S. Bank in minutes by using Chase QuickPay℠. 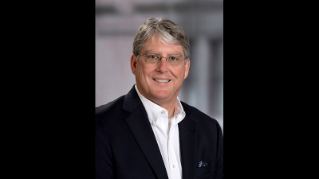 JPMorgan Chase today announced that Matt Kane has been named CEO of Commerce Solutions reporting to Gordon Smith, CEO of Consumer & Community Banking. He will relocate to Dallas, where the business is based, and join the Consumer & Community Banking Leadership Team. Customers of Chase’s newest cash back product can use cash back rewards in any amount to inject small moments of fun to boost daily happiness. Searching for a home goes DIY with the rise of tech and digital. America’s most popular banking portal gets a new look and feel. 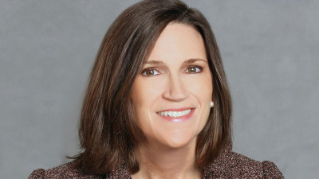 JPMorgan Chase & Co. (NYSE: JPM) today announced that Catherine Moore has been named President and Managing Director of Commerce Solutions, Europe for J.P. Morgan. She also serves as Executive Director of the group’s legal entity, Chase Paymentech Europe Limited (trading as J.P. Morgan), based in Dublin. Ink from Chase, the Business Card portfolio from Chase Card Services, announced today the rebrand and redesign of its Jot mobile application to the Ink app.